Not since Julie Taymor's brilliant Titus way back in 1999 have I seen a film so overflowing with such rich, imaginative imagery. Titus tied for my favorite film of 1999 (with Jim Jarmusch's stunning Ghost Dog: Way of the Samurai). It's going to take a miracle of a film to top The Fall in 2008. (Editor's note: in IMDB The Fall is listed as being a 2006 movie. I do not count it as such because it was not released in theaters until 2008 (certainly not in this area), so I had absolutely no opportunity to go back in time and see it in 2006. I've already made a list of my favorite 2006 films, and I cannot go back and change it. Therefore The Fall is a 2008 movie). The basic premise of the movie is that in a hospital in the 1930s, Roy, a stuntman whose gilrfriend left him, has been seriously injured in a stunt (possibly a suicide attempt) where he fell off a bridge. He cannot feel his legs anymore. A little Indian (from India) girl, Alexandria, is also at the hospital because she fell at the orchard where her family (including her) works as laborors. They have a kind of meet-cute and Roy begins telling Alexandria a story. We then see the story through Alexandria's imagination. Much of the wonderment of the movie comes from the fact that Alexandria imagines things in an unexpected way. This being the 1930s, Roy tells a story that has an Indian (from America) in it, complete with "squa" and "papoose" and all that. Alexandria is an Indian Indian, and so in her imagination the character is also an Indian Indian. Another great thing is that Roy is obviously just making the story up as he goes, and so sometimes the peculiar necessity of improv makes him include surprising details, including a very strange choice for one of the main characters of the story. Anyone who has seen Tarsem Singh's previous film, The Cell starring J-Lo, knows that Tarsem is capable of creating fascinating visuals, and The Fall ups that even further. The film is a riot of bold color choices, bizarre costumes, unbelievable locales, and awe-inspiring compositions. It is even more awe-inspiring when you realize just how few special effects there are in the film; the entire thing was actually filmed on locations that really exist, not sets or CGI backgrounds. As such, the unreality of the story has an almost frightening reality to it, like a dream that you wake up from but just for a moment you're not sure whether it was a dream or not. The attention to detail in the film is simply astonishing. There is one part of the story where the characters go searching around the entire globe, and there is a terribly quick montage of shots of the characters in front of various easily-identifiable world landmarks. With a few stock-footage exceptions, the cast and crew actually went to these locations. They actually went to France and got in costumes and stood in front of the Eiffel Tower for about eight frames worth of film. Tarsem financed the film himself off of the money he made from The Cell, and his uncompromised vision is truly amazing. A joy for me was the fact that not only were the story parts of the film great, but the parts that took place in the hospital were almost just as good. And that's due entirely to the great chemistry between Roy (played by Lee Pace of "Pushing Daisies" fame) and Alexandria, played by Catinca Untaru in what is probably the best child performance I've ever seen, because at no point does it ever look like she's acting. It looks like they just plopped her down in the scene and filmed while she went off. Because English is neither her nor her character's first language, there are a few wonderful moments where she's simply trying to communicate with Roy, and Lee Pace's bemused face is just perfect at these times. It seems 100% believable, which somehow makes the fiction segments seem that much more real and unreal at the same time. Much like Tim Burton's fantastic Big Fish a few years ago, The Fall is about the power of storytelling, essentially how lying reveals hidden inner truth. Roy's story is a lie on two levels: it's patently fiction (none of that ever happened), and it's also only a device that Roy uses to get Alexandria to do certain things for him in the real world. But the story takes on a life of its own in Alexandria's mind and becomes more than just the manipulations of a desparately sad man. The Fall is also a fascinating meditation on the role of the audience. After all, even though Roy is telling the story, it is through Alexandria's imagination that the story comes to life. And at the brilliant climax of the film when Alexandria pleads to Roy to change the direction the story is headed (trying not to be spoliery here), Roy tells her he can have whatever he wants to have happen—it's his story. Alexandria makes the simple statement of, "It's my story too." It got me thinking later of audience ownership in stories, and of the whole "Han Shot First" phenomenon. At what point do stories stop being about the author and start being about the audience? At what point do the creators of fiction stop having the "right" to create their own fiction? What responsiblity do authors have to their audiences and their expectations (why were people so mad about the final episode of "The Sopranos"), and what responsibility do they have to their own artistic vision? Is the purpose of your art to satisfy your own inner need of expression or to satisfy the audience's need for connection? I've always believed that an artist should be true to his own vision, and that pandering to any audience produces an inferior work. In the end, though, Roy changes his story to suit his audience and therefore forms a truly deep connection with Alexandria, one that in no way could have ever been formed if he had told the story he had originally gone to tell. By redeeming the end of his story he redeems himself. The Fall says that we are the stories that we tell. 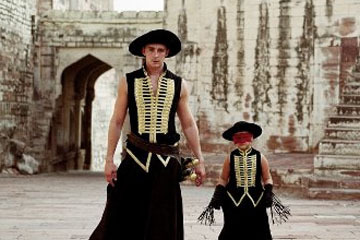 Tarsem Singh must be a beautiful person, then, because The Fall is a beautiful film. Not just visually. I tend to be pretty lenient with my reviews. It's rare that I give a film under three stars. Much of that is because I only see movies that I'm pretty sure I'm gonna like. But I'm also very stingy with my four-star reviews. Just look at this year so far: The Fall is the only movie I've given four stars to yet! And this year had Iron Man and Indiana Jones! Why did The Fall get four stars but a movie as perfectly flawless as Iron Man only get three-and-a-half? When I'm watching a movie there's something that happens way down in my gut that tells me when I'm watching a four-star movie. It's the feeling that I'm watching something truly extraordinary that somehow (I hate to use the term) transcends the limitations of genre and medium. Iron Man was a magnificent comic book movie, but in my heart that's all it was: a comic book movie. The Fall is magnificence itself.